In life’s most difficult moments, a thoughtful gift can mean so much. Our blooming dish garden is filled with a lovely trio of plants, including a white calla lily, white rose and white cyclamen. 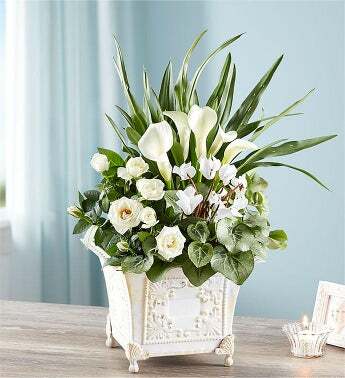 Elegantly arranged inside an antique-inspired footed white metal planter, it’s a peaceful expression of sympathy and a gentle reminder of your lasting support.